We custom-design and facilitate experiential team development sessions focused on creating high-performing teams. The feedback report outlines the team development agenda for improvement. Usually at a 6-month interval, follow-up assessments provide measurement and narrative feedback regarding the amount of improvement. We work with executive leadership, functional or departmental, cross-functional, or virtual teams. If the course is sufficiently clear and supported, it provides context for and guides the team’s actions. A clear course is a necessary condition for strategic success. These components form an internal directional system: purpose, vision, mission, strategy, goals, priorities, and action plans. Commitment is the unwavering choice to support the team and the team’s objectives with one’s best personal efforts. This quality establishes the necessary conditions for individual and team excellence. High performance requires clear roles, responsibilities, accountabilities, and the explicit individual and group agreements that empower people to risk action in the face of uncertainty. High-performance communication is facilitated when information and learning is shared among people and teams. When it is effective, it facilitates forward action and positive results. If ineffective, it creates chaos. High-performance communication is clear, consistent, timely, thorough, clear, and focused on the strategic imperatives of the business. Character refers to the defining qualities and values of the team that guide decisions concerning internal and external constituencies of the organization. The values and behaviors modeled by leadership establish the tone and expectations for the entire organization, making it a place where people feel proud to work. High character is indicated by the degree of congruity of actual behaviors compared against espoused values. Change and Creativity are the dual processes through which people and organizations continuously enhance their effectiveness. A compelling business case for change outlines the big picture, and continuous improvement processes provide process improvement technologies to improve systems. Savvy leaders follow an enlightened approach to leading change by directly addressing the issues that create fear, resistance, and sabotage of the change initiative. This process stimulates creativity and innovation; resistance evaporates. Teamwork in a high-performance organization is demonstrated by people’s willingness to form partnerships beyond simple “win/win” outcomes to create synergistic gains for the business. Internal politics, competition, and conflict inhibit the open sharing of breakthrough ideas needed to solve difficult business problems. Beyond common goals, skills for conflict resolution, trust building, and effective decision making are needed to create the optimal environment of mutual support. 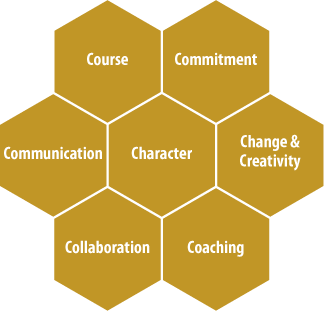 Transformational Coaching (as defined in The Heart of Coaching) is the art of empowering people to improve their effectiveness—in a way in which they feel helped. This process engages the huge untapped potential within people and organizations by focusing energy on key performance objectives. Coaching, as a key component of leadership, brings out the best in people. The Leadership team, having gone through The Heart of Coaching (THOC) first, was challenged to completely “own” the process of what it meant to be a coach. We purposely took a full year to work with our senior leaders to optimize the ownership and integration of the thoughts, beliefs and behaviors embedded in the THOC methodology. So, spend all the time you need to make sure you have that degree of ownership at the very top. We found it effective to use the phrase “in the spirit of coaching” to introduce a conversation and clearly frame our intention to help somebody improve. We all have blind spots; when we approached our direct managers for upward feedback, this stated positive intention and the act of requesting permission to deliver feedback helped the process work with people who were truly open to learning.